This package contains a bootable 150-foot HP 9144A tape cartridge image of the HP 24396H offline diagnostics and a listing of the diagnostic programs included. The tape may be booted directly on an HP 1000 either by copying the image to an HP 9144A Cartridge Tape Drive or by emulating a 9144 with the HPDrive program. ...plus any additional cards or devices to be tested. ...will copy the specified image to an HP 9144A set for bus address 0. Alternatively, any device capable of reading a 9144A tape cartridge (e.g., 9145A, 35401A, 7908P/R, etc.) may be used instead. The drive must be set to respond on HP-IB address 0, as the loader ROM will only boot from that address. ...will set up a 9144 emulation on bus address 0. 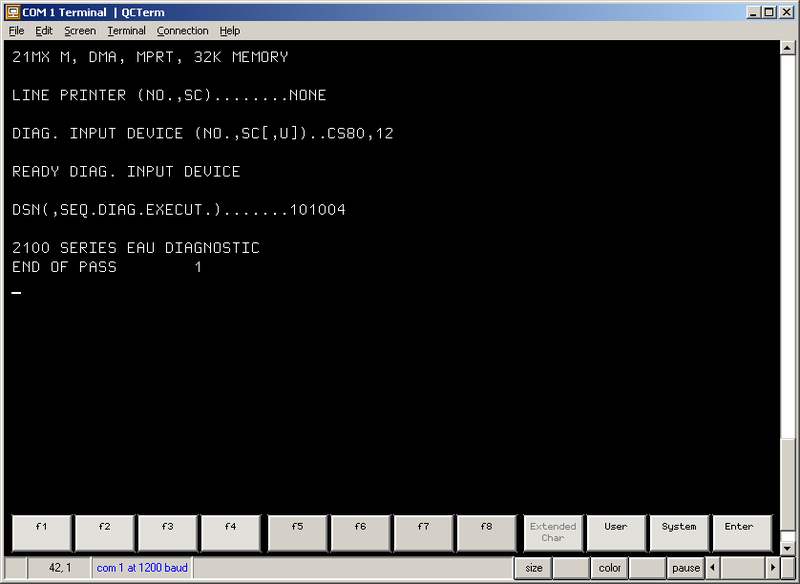 Once the GPIB card is connected to the 12821A Disc Interface and HPDrive is started to emulate a 9144, the procedure for booting and running the diagnostic image is identical to that used with a real drive. - Set S register bits 15-14 to the CS/80 loader ROM socket number, bits 11-6 to the select code of the 12821A card, bit 3 to 1, and bits 2-0 to the unit number (not bus address) of the drive. The unit number will normally be 0, unless the drive is part of an integrated disc/tape drive, such as a 7908, in which case the unit number will be 1. - Press STORE, PRESET, IBL, and RUN. The computer will halt with T = 102077. If T = 103033, bit 3 was not set to 1 above. - Set S register bits 5-0 to the select code of the terminal interface. - Set the P register to 100. The diagnostic configurator program will begin the conversational configuration through the terminal; specify "CS80" as the diagnostic input device. The manuals applicable to this release appear in the accompanying list, along with the diagnostic serial numbers (DSN) of the associated diagnostic programs. The DSNs are used to specify to the configurator the diagnostic to load from the tape image.